A UN report says there is "ample evidence" that both sides in the conflict in the Central African Republic (CAR) have committed war crimes and crimes against humanity. However, it says it is too early to speak of genocide or ethnic cleansing. In February, rights group Amnesty International described the conflict as one of ethnic cleansing and criticised the international response. The CAR descended into widespread religious conflict last year. 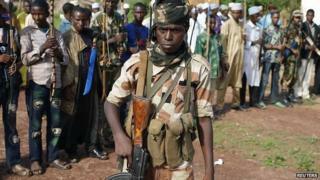 It began when mainly Muslim Seleka rebels seized power in the majority Christian country. Since then, more than a million people have fled their homes - about a quarter of the population. The preliminary report was drawn up by an international commission of inquiry appointed by UN chief Ban Ki-moon in January. "Ample evidence exists to prove that individuals from both sides of the conflict perpetuated serious breaches of international humanitarian law and crimes against humanity as well as war crimes," the report says. However, it said talk of an international armed conflict, genocide or ethnic cleansing "at this point in time is premature". But the report warned: "If the international community does not react with speed and determination by sending more peace keeping forces to CAR, we may soon face a situation which will rapidly deteriorate and bring about genocide and ethnic cleansing." Amnesty International objected to the findings. In an email to the Associated Press on Thursday, senior crisis response adviser Joanne Mariner wrote: "I would say that... the report is ignoring the fact that the massive displacement of the Muslim population in the Central African Republic is not simply a consequence of the violence there, but its goal." She said that Christian militia fighters "have made no secret of their intent to kill or forcibly expel all Muslims from the areas under their control". Unrest in CAR erupted last year after Muslim rebel leader Michel Djotodia seized power. Mr Djotodia resigned in January under diplomatic pressure, but violence between mainly Christian and mostly Muslim militia groups has continued. The UN is deploying a 12,000-strong peacekeeping force to CAR but not until September. There are currently some 2,000 French and 6,000 African troops in the country but the violence has continued.